Our first bike and barge tour in Italy was so successful that we expanded into France. 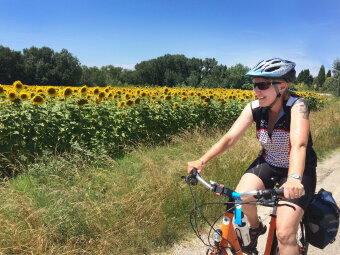 Join us in Provence and Camargue as we bike and barge through southern France down the Rhone River to the Mediterranean Sea. Flat terrain on paved roads with a couple short hills. Beginner to moderate cycling level. Beginner level with an e-bike. 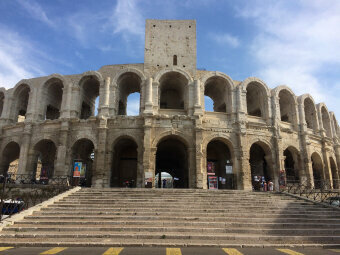 7 nights lodging, 7 breakfasts, 6 sack lunches, 7 dinners, cue sheets and maps, rental bicycle, guided walking tour of Arles, and trained bilingual guides. Our barge L'Estello holds 20 guests. Each room has two beds and its own bathroom. Loved our little cabin. 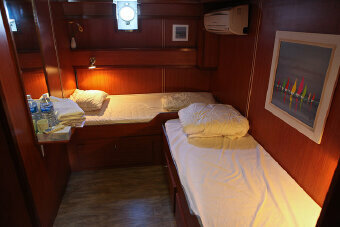 Certainly not fancy, but adequate and comfortable. Dinners surpassed expectations. Comments from other tours had me expecting great, but dinners were beyond great! 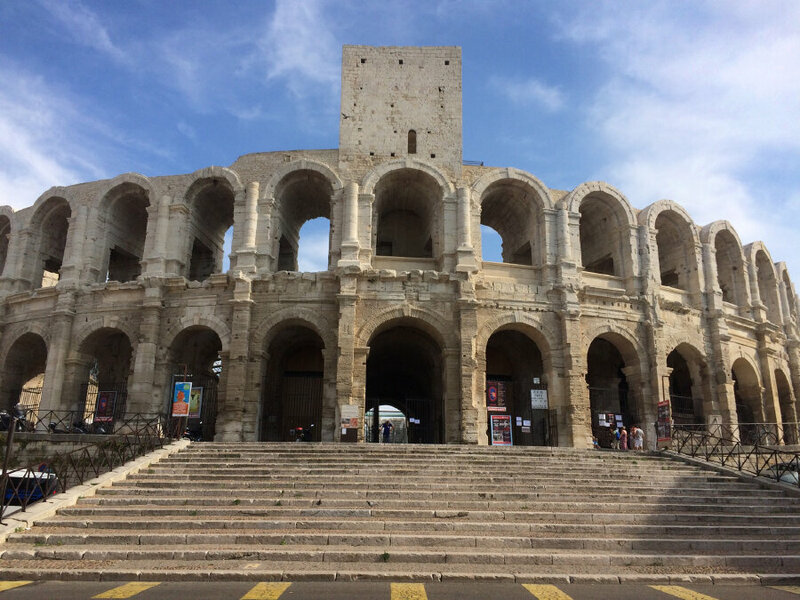 DAY 1: We meet at 6:30pm on board our boat, L’Estello, docked at the pier in the Rhone River just outside the medieval walls of the ancient city of Avignon. Our home away from home holds 20 guests. Each room has two beds and its own bathroom. 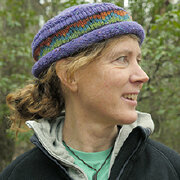 After introductions to the crew and an orientation, we’ll enjoy our first dinner together on the barge. 0 miles. DAY 2: After breakfast on the boat, we’ll get fitted to our bicycles, and then cross the Rhone to the island Île de la Barthelasse. 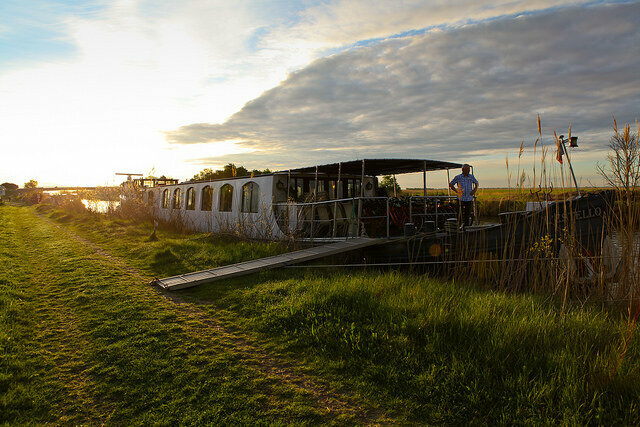 The largest and flattest river island in France, it’s been protected from development for centuries, so it’s a cycling paradise! 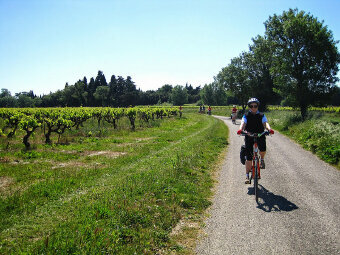 We’ll finish our bike ride through vineyards and nectarine orchards. 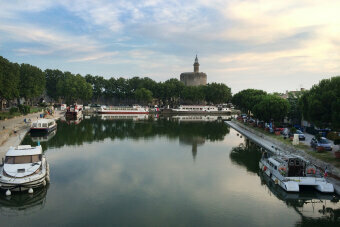 Be sure to save some energy to walk around beautiful Avignon before or after dinner on the barge. The entire city center is a UNESCO World Heritage Site and is still surrounded by its limestone ramparts. 19 miles. DAY 3: This morning, we’ll motor to the town of Aramon. 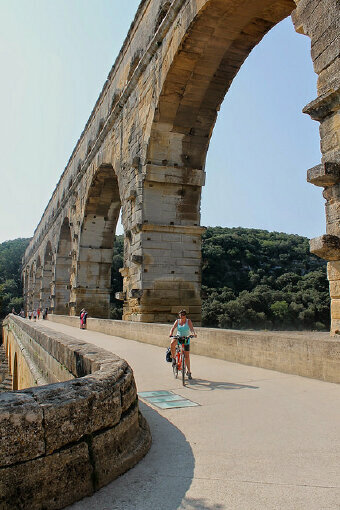 Then we’ll cycle to the Pont du Gard, a UNESCO World Heritage Site that dates from the first century. The Romans built the aqueduct over the Gardon River to carry water more than 30 miles from a spring to the city of Nimes. After visiting a fascinating museum about what many consider to be the greatest bridge built in Classical times, you can take a swim. Then we'll head back to our boat for dinner while enjoying a view of Mt. Ventoux off in the distance. 25 miles. 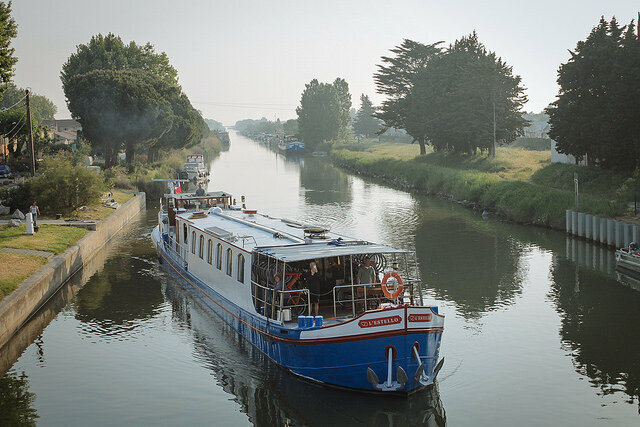 DAY 4: We’ll start our day with a short boat trip down the river to a mooring in the town of Vallabrègues. 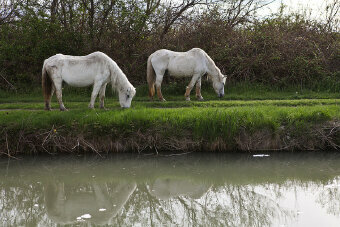 We’ll ride to the village of Barbentane that used to be located on the river. It was destroyed so many times over the centuries that it was finally rebuilt up on a hill. You can take a self-guided walk through the historic town center, visit the open-air flea market, or enjoy a café before continuing on your bicycle. 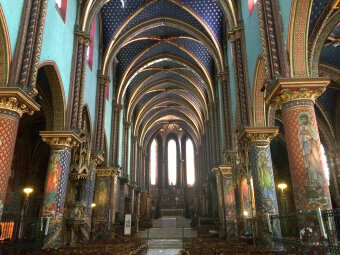 Our next stop is the magnificent monastery of St. Michel de Frigolet. 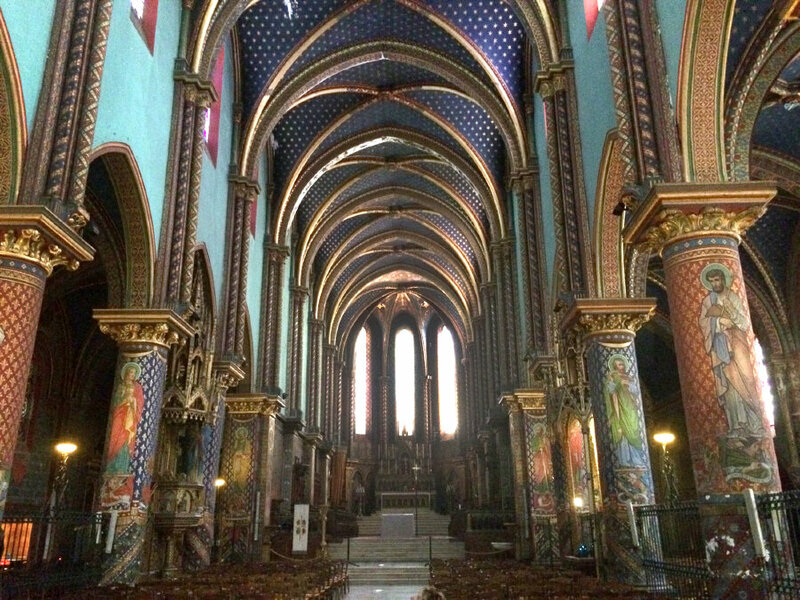 Dating back to the 12c, it has an elaborately painted church surrounded by lush gardens. 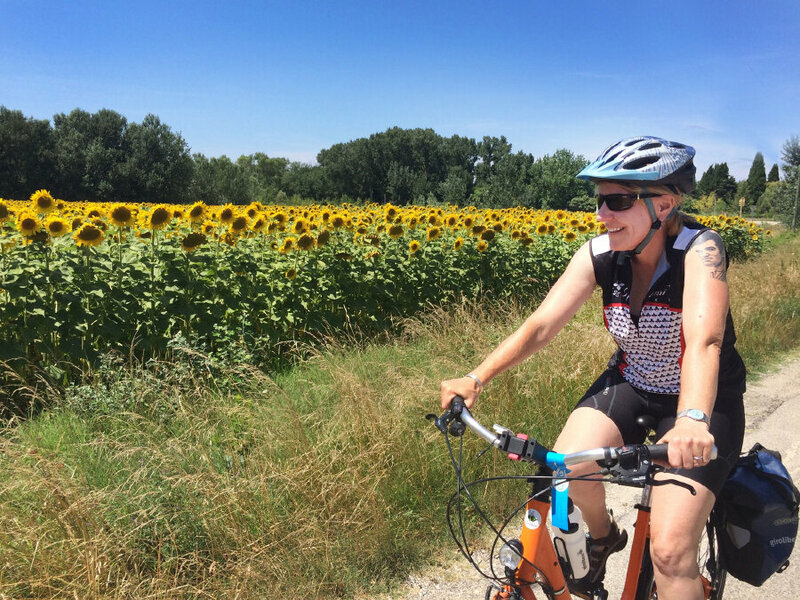 We’ll bicycle back to our boat through fields of olive and almond trees, sunflowers and lavender, with the sound of cicadas filling the air. 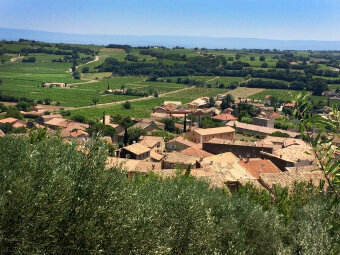 Then you’ll have time before dinner to walk into town and experience life in a small Provençal village. There is usually a game going on in the arena where teams of men compete to collect strings off the horns of bulls. There is often a bocce tournament in the central park too. 22 miles. DAY 5: Today’s ride is the most beautiful of the week. 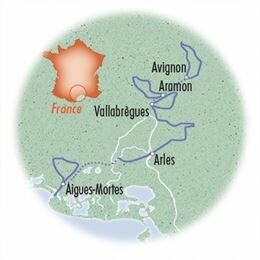 We’ll begin by cycling to the village of St. Rémy. 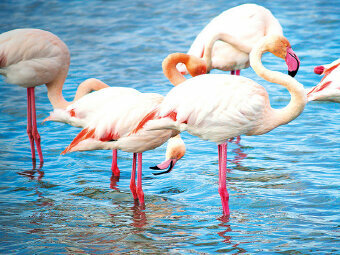 Its weekly outdoor market will be taking place and it’s an event for the whole region. 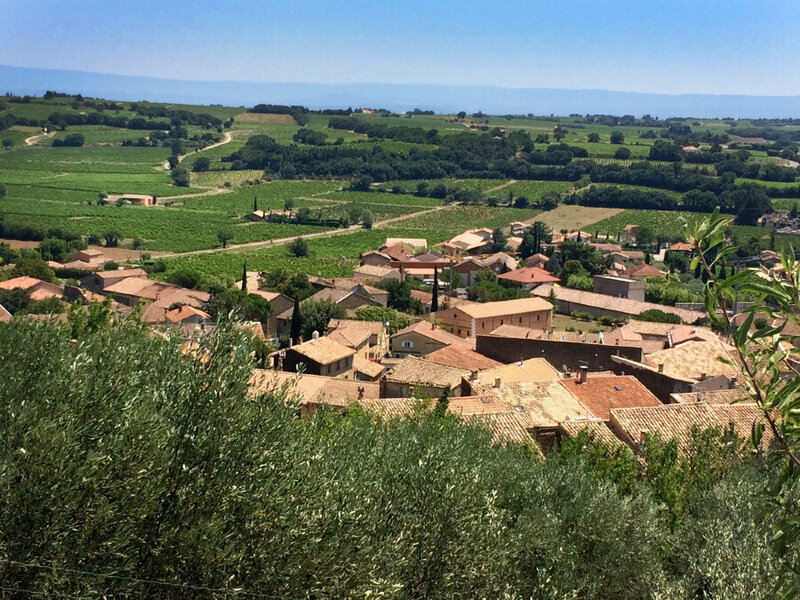 You can practice your French and buy souvenirs like local lavender honey or brightly colored yellow and orange Provençal pottery. Then we will continue on through the beautiful limestone hills of Les Alpilles. Their rock was used for centuries to build nearby cities. You should stop for the multimedia show that takes place inside one of these hills in the vast empty caverns left over from the quarries. It’s a spectacular display you won’t forget. Finally, we’ll head to Les Baux-de-Provence, voted one of the most picturesque villages in France. When you see the narrow stone-paved alleys lined with quaint terracotta-roofed limestone buildings, you’ll certainly agree. We’ll finish the day in the city of Arles. 34 miles. 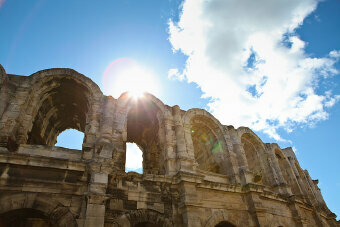 DAY 6: We’ll begin our morning with a guided walking tour of Arles. We’ll learn about its importance as a Roman capital during the first century and its golden age during the 5c as an important industrial and religious center. It is perhaps best known today for the paintings that the Dutch painter Vincent van Gogh produced during his one year here in the 19c. You can stand at the same spot where he painted the beautiful Starry Night Over the Rhone. After lunch, we’ll get back on our bikes for a short ride through rice fields and pastures dotted with wild Camargue white horses. 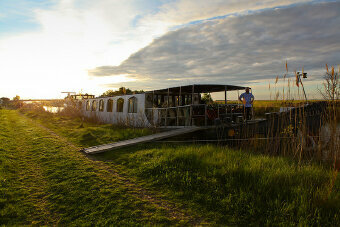 Then we’ll meet our barge and sail down to the walled medieval town of Aigues-Mortes. 15 miles. DAY 7: Our last bike ride is a loop ride. We’ll stop for lunch on the banks of the Vidourle River, for photos at the Carbonnière Tower, and at the beach for a chance to see flamingoes and take a dip in the Mediterranean Sea. 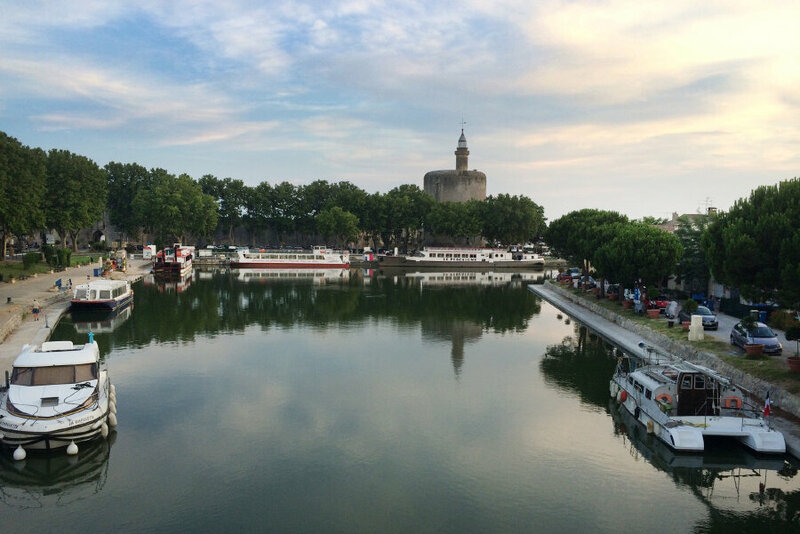 Once back at our barge, be sure to take a stroll into the pretty city of Aigues-Mortes. Built in the 13c, it has changed little over time, as its white limestone buildings have always been protected from attack by its fortified walls and surrounding marshlands. 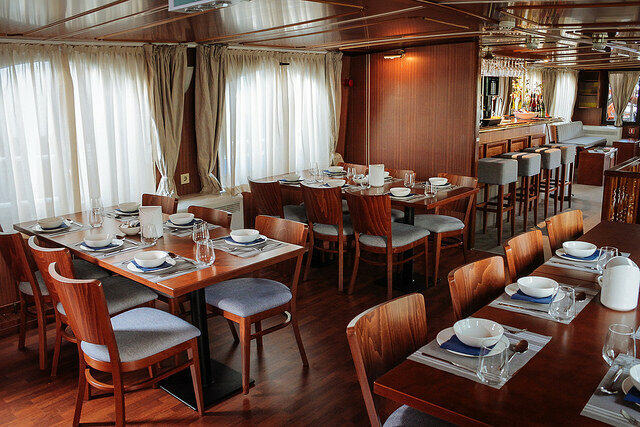 We’ll enjoy our last dinner together tonight on our boat and reminisce about our wonderful week together. 28 or 36 miles. DAY 8: We’ll say our good-byes after breakfast. 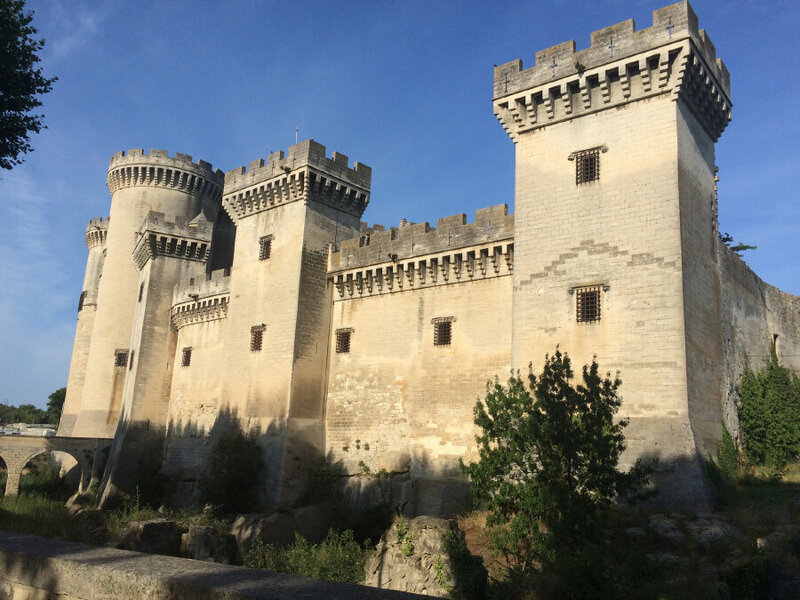 It’s a short walk to the Aigues-Mortes train station for your return home. Bon voyage! 0 miles.